A team of researchers in the Cockrell School of Engineering at The University of Texas at Austin has invented a method for producing inexpensive and high-performing wearable patches that can continuously monitor the body’s vital signs for human health and performance tracking, potentially outperforming traditional monitoring tools such as cardiac event monitors. The researchers published a paper on their patent-pending process in Advanced Materials on Sept. 23. The team’s breakthrough is a repeatable “cut-and-paste” method that cuts manufacturing time from several days to only 20 minutes. The researchers believe their new method is compatible with roll-to-roll manufacturing — an existing method for creating devices in bulk using a roll of flexible plastic and a processing machine. 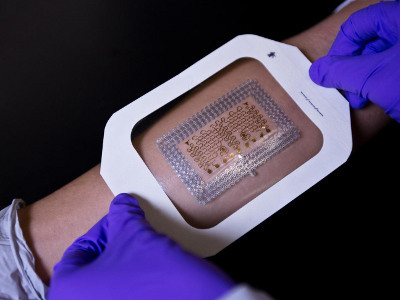 Reliable, ultrathin wearable electronic devices that stick to the skin like a temporary tattoo are a relatively new innovation. These devices have the ability to pick up and transmit the human body’s vital signals, tracking heart rate, hydration level, muscle movement, temperature and brain activity. Although it is a promising invention, a lengthy, tedious and costly production process has until now hampered these wearables’ potential. The UT Austin method is the first dry and portable process for producing these electronics, which, unlike the current method, does not require a clean room, wafers and other expensive resources and equipment. Instead, the technique relies on freeform manufacturing, which is similar in scope to 3-D printing but different in that material is removed instead of added. The two-step process starts with inexpensive, pre-fabricated, industrial-quality metal deposited on polymer sheets. First, an electronic mechanical cutter is used to form patterns on the metal-polymer sheets. Second, after removing excessive areas, the electronics are printed onto any polymer adhesives, including temporary tattoo films. The cutter is programmable so the size of the patch and pattern can be easily customized. After producing the cut-and-pasted patches, the researchers tested them as part of their study. In each test, the researchers’ newly fabricated patches picked up body signals that were stronger than those taken by existing medical devices, including an ECG/EKG, a tool used to assess the electrical and muscular function of the heart. The team also found that their patch conforms almost perfectly to the skin, minimizing motion-induced false signals or errors. This research was funded by NSF grants, including Lu’s NSF CAREER grant.